A twin blast has hit the Saint Petersburg metro on Monday. The reported blasts occurred at the "Sennaya Ploschad [square]" and "Tekhnologichesky Institute" stations. At least 10 people were killed. Sennaya Ploschad is engulfed by smoke. Emergency services have been sent to the scene. A terrorist suspected of carrying out a deadly bomb attack in St. Petersburg subway on Monday had links to radical Islamist groups operating in Russia, a law enforcement source told Sputnik. The source declined to provide the names and details on origin of these groups. At least 11 people were killed and 45 others were wounded in a blast in St. Petersburg subway on Monday. A local law enforcement source told Sputnik that an explosive device found at the Ploshchad Vosstania metro station in St. Petersburg and destroyed by a bomb squad contained a charge of one kilogram of TNT. "The bomb that was destroyed, had a power equivalent of one kilogram of TNT, it was clearly a self-made device that is frequently used by terrorists or 'inadequate' citizens," the source said. Shocked and dazed by a terrorist attack that rocked their city, the residents of St. Petersburg rallied to deal with the aftermath of the bombing, rushing to help those affected by the blast in St. Petersburg metro. Ret. Lt. Col. Andrei Popov, former special forces operator and member of the Alpha anti-terrorist group veterans' association, noted that the city residents displayed a remarkable absence of panic and hysteria in the aftermath of the explosion. "My attention was drawn to a woman wearing a torn undercoat which hinted at the fact that she also was in that carriage. She was visibly shaken, and yet there she was, helping other people to get out of the wrecked train carriage," Popov remarked. And as the city subway system was temporarily shut down, local taxi company Taxovichkoff quickly stepped in to offer its services for free to the people who found themselves deprived of affordable means of transportation. "In times like these the whole city and the nation must stand together and help those in need, including people who are unable to commute back home from work," a company representative said. — Irina Galushko (@IrinaGalushkoRT) 3 апреля 2017 г. In memory of the victims of the St. Petersburg metro attack, Tel Aviv City Hall has been illuminated with the colors of the Russian flag. — Рихард Зорге (@RichardSorge) 3 апреля 2017 г. Earlier, Prime Minister Benjamin Netanyahu expressed his condolences to Russia. 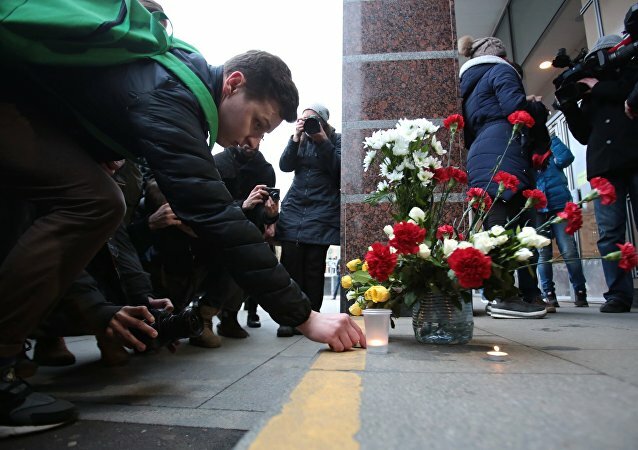 Russian President Vladimir Putin laid flowers near the Tekhnologichesky Institut station in St. Petersburg's subway, where a deadly attack took place earlier on Monday, a Sputnik correspondent reported. — Алферова Юля  (@AlferovaYulya) 3 апреля 2017 г. The United States denounces the attack in the St. Petersburg metro, White House Press Secretary Sean Spicer said in a briefing on Monday. "The President has been briefed on today's attack in Saint-Petersburg's metro. The United States condemns this reprehensible attack as act of violence," Spicer stated. "Our thoughts and prayers with the injured and with the Russian people, as we extend our deepest condolences to the loved ones who have been killed and injured." He added that the US is prepared to offer assistance to Russia that it may require in investigating this crime. Officials have revised the fatality count from 10 to 11, and eight individuals have been added to the list of people with injuries from the attack, the investigating commission has said. Officials have revised the previous fatality count from 10 to 11 after an explosion in a St. Petersburg subway car on Monday. Eight individuals have been added to the list of people with injuries from the attack, the investigating commission said. Washington condemns "the reprehensible attack" in Saint Petersburg and is ready to offer assistance to Russia. German Chancellor Angela Merkel extended condolences to Russia on Monday over the deadly explosion in St. Petersburg metro, denouncing the blast as a "barbaric act." Israeli Prime Minister Benjamin Netanyahu expressed condolences on Monday to the families of victims of the explosion in St. Petersburg, which hit the city's metro earlier in the day. "On behalf of the Government of Israel, I send condolences to President Putin and to the families of those who were murdered, following today's bombing on the St. Petersburg subway. The citizens of Israel stand alongside the Russian people at this difficult time," a statement on Netanyahu's website said. The French Interior Ministry has reinforced security measures in public transport in the Ile-de-France region following an explosion in St. Petersburg underground, the ministry said in a statement Monday. Four French presidential candidates united in extending condolences to Russian people after a deadly explosion in the Saint Petersburg subway. Irish Foreign Minister Charlie Flanagan expressed condolences to people in Russia over the explosion in the St. Petersburg metro on Monday. "I wish to offer the heartfelt condolences of the Irish people and the Government of Ireland to the families of those who have lost their lives and those who have been injured in the explosion," Flanagan stated. "My thoughts and deepest sympathies are with the Russian people at this difficult time." St.Petersburg authorities declared a three-day mourning in the city from Tuesday after the metro explosion. Italian President Sergio Mattarella said Monday he was devastated by the news of a deadly blast that killed ten commuters in a Russian subway, in a letter to President Vladimir Putin. "I was dismayed to learn about the explosion that claimed lives and injured numerous passengers in St. Petersburg metro. I am following with great apprehension the developments around this tragic event and would like to extend my condolences to you and the friendly people of Russia," Mattarella wrote. An explosion in St.Petersburg metro occurred as the train moved between stations, the Investigative Committee stated on Monday. The United States is committed to supporting Russia in fighting terrorist organizations, US Ambassador to the United Nations Nikki Haley said in a statement after a deadly explosion in the St. Petersburg metro on Monday. Haley expressed condolences to the people of Russia affected by the tragic event, which left ten dead and 37 injured. US President Donald Trump stated earlier on Monday the explosion in St. Petersburg was an "absolutely terrible thing." Russian authorities said they have opened a terrorist case with respect to the blast in the St. Petersburg metro. — Nikki Haley (@nikkihaley) 3 апреля 2017 г. Former Croatian President Stjepan Mesic expressed hope that Russian authorities would find those responsible for an explosion in the underground of St. Petersburg and bring criminals to justice, the politician's head of office told Sputnik on Monday. "So far, H.E. Mr.Mesic has no further information or deeper knowledge regarding this indeed tragic incidence that occurred in St.Petersburg. Nevertheless, since so far none organization took blame for the event, H.E. is placing his hopes in Russian Authorities who, H.E. has no doubt in it, will get to the bottom of the cause of the incident, and deal with causing party accordingly," Mirjana Pavokovic said. The former Croatian president also expressed condolences to the Russian people. US President Donald Trump said on Monday that a deadly explosion at a subway train in Saint Petersburg, Russia, is a horrible event. The Washington Times has apparently used a photo taken during the March 26 protests to illustrate a report about an explosion in St. Petersburg metro. Federica Mogherini said that EU foreign ministers are following the news coming from St Petersburg following blasts in the city’s underground. Moments after an explosion hit a metro station in St. Petersburg on Monday, commuters fled the scene as carnage unfolded. An improvised explosive device was found and made safe at the Ploshchad Vosstania metro station in St. Petersburg on Monday, Russia's National Anti-Terrorist Committee (NAK) said. Russia’s Transport Ministry (Mintrans) has ordered regional departments to ramp up anti-terrorism security after a deadly blast hit a subway train in St. Petersburg on Monday. "Russia’s Mintrans has sent a telegram to subjects [federal units] of the transportation infrastructure ordering a rise in anti-terrorism security measures," the ministry’s statement read. Transport Minister Maxim Sokolov expressed condolences to the nearest and dearest of those who lost their lives in the explosion on a stretch between two underground stations. Turkey’s Foreign Minister Mevlut Cavusoglu on Monday extended condolences to Russians over the deadly explosion that hit St. Petersburg subway earlier in the day. I strongly condemn the heinous attack in St.Petersburg that claimed many lives. Condolences to the Russian people. — Mevlüt Çavuşoğlu (@MevlutCavusoglu) 3 апреля 2017 г.
Italian Foreign Minister Angelino Alfano conveyed condolences on Monday to the families of St. Petersburg underground blast's victims. "I express the strongest condemnation, condolences and solidarity of Italy with the Russian people and the state in connection with what happened a few hours ago in St. Petersburg," Alfano said. The minister added that Italy would remain a country close to Russia in the fight against terrorism. Over 1,200 people were evacuated after a blast rocked a metro train in St. Petersburg and rescue teams and emergency services are examining the underground of the city, the Russian Emergencies Ministry said Monday. "The firefighting and rescue units of the Russian Ministry of Emergency Situations were among the first to arrive at the site of the incident and, alongside emergency medical aid teams, swiftly organized help and evacuation of the passengers. Over 1,200 people were evacuated," the ministry said in a statement. According to the ministry, a Ka-32 helicopter was used to bring the injured to the city's hospitals. The firefighting and emergency services are examining the underground tunnels, with all trains temporarily suspended. The city authorities established five bus lines with over 160 buses, replicating the metro lines. The ministry's main office in St. Petersburg keeps psychological help hotlines open. Members of the Indian parliament on Monday told Sputnik that they were expressing their condolences to the families of people killed and wounded in the recent explosion in the subway of Russia's St. Petersburg. "My sympathy to the families of my Russian friends who lost their lives in the blast. It's a very heinous crime against the humanity. Now its high time that all countries of the world must unite to fight the menace of terrorism," D Raja said. His words were echoed by another lawmaker Jagdambika Pal, who expressed support to Russia in light of a terrorist threat. "We are with Russia in this time of crisis. Terrorism has no boundaries. It is affecting every nation and taking innocent lives," Pal said. He added that Russian President Vladimir Putin was a "strong man" and should respond to the threat sternly. The Russian Transport Ministry created on Monday a crisis center following a deadly explosion in the St. Petersburg metro, the ministry's press service said in a statement. "In light of the emergency in St. Petersburg metro on April 3, 2017, the Russian Transport Ministry created a crisis center to coordinate activities of branch departments and organizations of the transport system, as well as to interact with law enforcement agencies and the St. Petersburg administration," the statement said. The statement added that Nikolai Zakhryapin, Russia's deputy transport minister, was appointed to head the crisis center. Spanish Foreign Minister Alfonso Maria Dastis and Minister of Internal Affairs Juan Ignacio Zoido Alvarez expressed solidarity with St. Petersburg’s residents over the explosion which hit the city’s metro earlier in the day. "All our solidarity is with Saint Petersburg," Zoido wrote on Twitter. He also published the telephone number of the Spanish Consulate in St. Petersburg which could be used by the Spanish citizens leaving in the Russian city and their relatives. "I follow with pain the news on the explosion in St. Petersburg. My solidarity with the victims and their families," Dastis published on Twitter. The Spanish Ministry of the Interior published on Twitter the recommendations for the Spanish nationals currently in St. Petersburg. "The explosion in the metro in St. Petersburg: avoid the affected areas, be extremely careful and follow the directions of the local authorities," the Interior Minister’s message read. The representatives of the Spanish Foreign Ministry told Sputnik they could not share any information on the possible presence of the Spanish citizens at the scene. The improvised explosive device, which was disarmed in St. Petersburg underground earlier in the day had shrapnel in it, Russia's Federal Security Service (FSB) said in a press release. "About 15.00 [local time] at the Ploshchad Vosstaniya metro station an improvised explosive device, which was equipped with striking elements, was found. This device was defused by bomb technicians in a timely manner, there are no casualties," the press release read. Ukrainian Foreign Minister Pavlo Klimkin on Monday expressed his condolences to the families of those killed and injured in the explosion in the St. Petersburg subway. "We are finding out whether Ukrainians were injured in St. Petersburg, I express my condolences to the families of those killed and injured," Klimkin wrote on Twitter. — Sputnik UK (@SputnikNewsUK) 3 апреля 2017 г.
Swedish Foreign Minister Margot Wallstrom condemned on Monday the explosion in St. Petersburg underground and expressed condolences to the families of victims. Strongly condemn the bomb attack in #SaintPetersburg. I offer my sincere condolences to the victims's families and #Russia. — Margot Wallström (@margotwallstrom) 3 апреля 2017 г.
Ottawa is in contact with the Russian authorities following a deadly attack in the St. Petersburg metro earlier on Monday, Global Affairs Canada spokesman Austin Jean told Sputnik. "Global Affairs Canada is closely monitoring reports of an incident in St Petersburg, Russia. Our thoughts are with those who have been affected," Jean said. "We are in contact with local authorities and stand ready to provide consular assistance to Canadian citizens if needed." Ottawa has urged Canadian citizens in St. Petersburg to remain vigilant and contact their families and friends. Those in need of consular assistance should contact the Canadian embassy in Moscow or the Emergency Watch and Response Centre in Ottawa. Pulkovo International Airport in the Russian city of St. Petersburg denied reports, which said it had been shut down due to the explosion in the city’s metro, the airport’s press service said in a statement Monday. "In relation to the media reports on the closure of Pulkovo Airport, the press service of Pulkovo states that this information is not true," the statement said. The press service added that the airport was open and flights were all running on schedule. The statement did note, however, that both airport entry and pre-flight security checks had been tightened. Austrian Foreign Minister Sebastian Kurz conveyed condolences on Monday to the families of St. Petersburg underground blast's victims. The Russian Investigative Committee has opened a terrorist act case following the deadly blast in the Saint Petersburg subway on Monday. Direful news from #StPetersburg; sincere condolences to those who lost relatives in metro attack; must close ranks in countering terrorism. — Sebastian Kurz (@sebastiankurz) 3 апреля 2017 г. Measures are being taken to strengthen the antiterrorism protection of transport facilities and transport infrastructure in St. Petersburg following the explosion in the city, the National Antiterrorism Committee (NAC) said in a statement Monday. "In connection with the explosion in the St. Petersburg subway, NAC has issued appropriate orders and is taking the necessary measures to strengthen the antiterrorism protection of transport facilities and transport infrastructure, as well as crowded places," the statement said. Russia's Investigative Committee said that a group of experienced investigators and criminologists has been sent to investigate a blast in St. Petersburg metro on Monday. All services in St. Petersburg after the blast in the city subway worked promptly, Russian Prosecutor General's Office spokesman Alexander Kurennoy said Monday. "The reaction of my colleagues from operative services was quite prompt... The progress of the check on this case has been put on control both by the city prosecutor's office and the Prosecutor General's Office," Kurennoy said on the Rossiya-24 television channel. He said Russian law enforcement agencies will determine whether security measures in the St. Petersburg subway were sufficient, adding that speaking of the explosion's causes is premature yet. "It is a terrible terrorist attack, whose organizers and perpetrators must be identified and severely punished," Kadyrov wrote in his Instagram blog. German government has expressed its condolences over blasts in St.Petersburg metro to the families of victims. The explosion in St.Petersburg metro occurred as the train was moving between stations, the Investigative Committee stated on Monday. 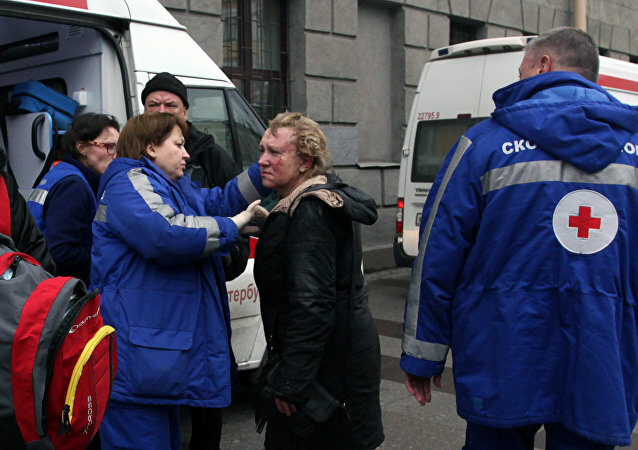 St.Petersburg authorities declared a three-day mourning in the city starting from Tuesday after the metro explosion. At least 10 people were killed and 37 others injured in a blast in St. Petersburg metro on Monday, Russian Health Minister Veronika Skvortsova said. "The number of victims stands at 47 at this point. Seven were killed at the site, one died while being transported to a hospital, and 39 were hospitalized. Two of the hospitalized later died from blast injuries," Skvortsova told reporters. "The remaining victims are receiving all necessary medical assistance. Six of them are in grave condition," Skvortsova added. There are no threats to the metro system in Washington, DC or planned changes to its security after the blasts in St. Petersburg, Russia earlier on Monday, Metro Transit Police told Sputnik. "Metro Transit Police are following developments out of St. Petersburg and are receiving periodic updates from our federal law enforcement partners," the Metro Transit Police said. "At this time, there is no specific or credible threat to Metro, and there has been no announced change in Metro’s security posture, which remains elevated." Страшные первые кадры после теракта в Питере! — Константин (@odessa_1794) 3 апреля 2017 г.
Egypt offers Russia its condolences over the blast in St. Petersburg underground and reiterates its warning over the threat of the spread of terrorism, the country's Foreign Ministry said Monday in a statement. "Egypt strongly condemns the explosion that occurred today in Russia's second largest city St. Petersburg, offers condolences to the families of the deceased and wishes speedy recovery to the injured ... Egypt expresses solidarity with the government and the people of Russia in this situation," the statement read. The statement also reaffirmed Egypt's position on the danger of the spread of terrorism and urged all countries to join efforts to fight against this threat. International Committee of the Red Cross (ICRC) expressed its condolences on Monday over blast in the subway in the Russian city of St. Petersburg. "We are deeply shocked by tragedy in St. Petersburg. We offer condolences to the families of victims and wish a speedy recovery to the injured," the ICRC wrote on Twitter. Мы глубоко потрясены трагедией в #СанктПетербург. Выражаем соболезнования семьям погибших и желаем скорейшего выздоровления пострадавшим. — МККК (@MKKK) 3 апреля 2017 г.
Russian President Vladimir Putin ordered the authorities of St. Petersburg on Monday to provide assistance to the families of people killed in the underground explosion and to the people injured in the incident. "The authorities of the city, and the federal ones if needed, will take all necessary steps to provide help to the relatives of the killed [in the explosion] and to our wounded citizens," Putin said, as quoted by the Kremlin's press service. He added that the country's law enforcement agencies would make every effort to find out the reasons behind the deadly explosion. Lithuanian Foreign Minister Linas Linkevicius conveyed condolences on Monday to the families of St. Petersburg underground blast victims. — Linas Linkevicius (@LinkeviciusL) 3 апреля 2017 г.
Lamberto Zannier, the secretary general of the Organization for Security and Co-operation in Europe (OSCE), offered his condolences on Monday to those affected by a deadly blast on a subway line in Russia's St. Petersburg. — lamberto zannier (@lamzannier) 3 апреля 2017 г. The UK Foreign Office is in contact with Russian authorities after a deadly blast in the city of St. Petersburg, the UK Foreign Office's spokesperson said Monday. "We are liaising with Russian authorities following explosions on the St Petersburg metro. Our sympathies are with those affected and their loved ones," the spokesperson said in a statement. — Viktor Olkhovyi (@Viki_34) 3 апреля 2017 г.
Turkish Prime Minister Binali Yıldırım expressed condolences in a phone call to Russian Prime Minister Dmitry Medvedev over a deadly blast in St. Petersburg metro on Monday, Turkish NTV television reported. — Antalya City Blog ⚓ (@AntalyaCityBlog) 3 апреля 2017 г.
Vladimir Putin’s spokesman Dmitry Peskov denied media reports that claimed the Russian president was to pass the underground station in St. Petersburg where a blast erupted on Monday, in a comment to Sputnik. "Nonsense. The president is working in Strelna," Peskov said. President Putin is in St. Petersburg, meeting his Belarusian counterpart Alexander Lukashenko. The meeting was held earlier in the day at the Konstantin Palace in Strelna, a municipal village on the western outskirts overlooking the Gulf of Finland. The talks were marred by an explosion that went off in the city center. A source told Sputnik the explosive device appeared to be home-made. French Foreign Minister Jean-Marc Ayrault on Monday expressed his condolences over explosion in St, Petersburg and expressed solidarity with Russian people on behalf of Paris. "I would like to express my solidarity with the victims, and offer my condolences to the Russian people because of this challenge. We do not know the reasons, but we are with those who are suffering. That is why I want to express solidarity on behalf of France," Ayrault said after a Foreign Affairs Council session. The French foreign minister added that he was not aware of any French victims of the blast, but noted that the French consulate in St. Petersburg was available to all French people who may have questions. — bbcrussian (@bbcrussian) 3 апреля 2017 г. "I want to express words of the most sincere regret, sympathy to relatives of those killed and injured. I have already talked to the heads of special services, with the FSB director. Law enforcement agencies and special services are working, they will do everything in order to reveal the causes of what happened," Vladimir Putin said at a meeting with Belarussian President Alexander Lukashenko, commenting on the blasts in the St. Petersburg subway. German Foreign Minister Sigmar Gabriel said Monday he was shocked by the news of an explosion at a Russian underground station in St. Petersburg. "I am following terrible news coming from St. Petersburg with a great dismay," Gabriel said in a statement. "There’s a lot pointing at a treacherous attack at innocent people that were just going about their daily business. This crime cannot be justified." "In this dark hour, our thoughts go out to our friends in Russia, to victims and their families," the minister added. — MilitaryMaps (@MilitaryMaps) 3 апреля 2017 г. Secretary General of the Council of Europe Thorbjorn Jagland expressed his condolences on Monday over blast in the subway in the Russian city of St. Petersburg. — Thorbjørn Jagland (@TJagland) 3 апреля 2017 г. All possible causes of the St Petersburg underground explosion, including terrorism, are being considered in the investigation of the incident, Russian President Vladimir Putin said Monday. "The causes are not clear, so it is premature to speak of this. The investigation will reveal [them]. However, obviously we are always considering all options - technical and criminal, first of all, manifestations of a terrorist nature," Putin said. The Greek Foreign Ministry expressed condolences on Monday to the families of victims of a blast in the underground of the Russian city of St. Petersburg, stressing that the country was appalled by the tragic event. "Greece is shocked ... by blasts in St. Petersburg subway. Greece stands on the side of the Russian people and its government and expresses sincere condolences to the families of victims and wishes a speedy recovery to the injured," the ministry said in a statement obtained by Sputnik. The Greek Consulate General in St. Petersburg is closely monitoring the situation, according to the ministry. A source in the ministry told Sputnik that Athens "took very seriously" the information about the deadly incident. — Телеканал ЗВЕЗДА (@zvezdanews) 3 апреля 2017 г.
St. Petersburg Governor Georgy Poltavchenko confirmed Monday that there had been killed and wounded in a blast in St. Petersburg earlier in the day. "People were killed in a metro blast. Many were wounded. I express deepest condolences to relatives and families of the victims. 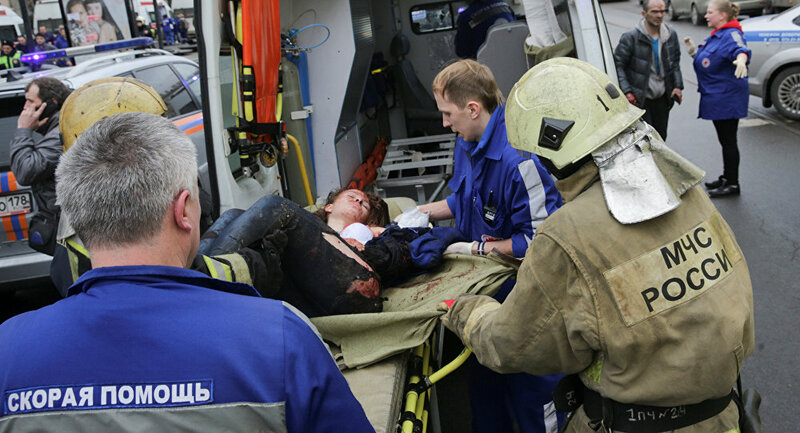 and wish speedy recovery for the wounded," Poltavchenko said in a statement posted on the city administration's website. — twénty_øne_házz (@NastyaBykova4) 3 апреля 2017 г. A homemade explosive device has been defused at the Ploschad Vosstaniya metro station in Saint Petersburg. — Новости Новороссии (@novorossianews) 3 апреля 2017 г. — Вестник Дамаска (@NovostiDamask) 3 апреля 2017 г. The aim of the blast in the Russian city of St. Petersburg was to strike a blow against Russia and its president, who challenged the international terrorism, Moldovan President Igor Dodon said Monday. "The international terrorism has no borders, no nationalities, no religion. Whoever committed this crime, it was intended to strike a blow against Russia and its president, who defied international terrorism and conducts effective actions to combat terror in different parts of the world," Dodon wrote on his official Facebook account. NATO Secretary General Jens Stoltenberg expressed his sympathies on Monday to those affected by the St Petersburg underground explosion. — Jens Stoltenberg (@jensstoltenberg) 3 апреля 2017 г. The blast that hit the Saint Petersburg subway killed nine and left more than 20 people injured, the Russian Anti-Terrorism Committee (NAK) said. "According to preliminary data, at least nine people were killed, and over 20 people were wounded, some of them gravely. All injured are receiving all necessary medical and psychological assistance," the NAK said in a statement. — Veit JDM (@veit1337) 3 апреля 2017 г. The United States is monitoring the situation after a blast in St. Petersburg metro, a White House official told Sputnik on Monday. The official said the US authorities do not yet have any information regarding American victims. — Petya Barzilska (@PetyaBarzilska) 3 апреля 2017 г.
Bratislava is extremely shocked by an explosion in St. Petersburg's underground, which claimed lives of at least 10 people and injured over dozens more, a spokesman for Slovakia's Ministry of Foreign and European Affairs told Sputnik on Monday. "It is too early to comment on the incident other than to say we are clearly and utterly shocked by the loss of life of 10 people and injuries sustained by dozens more," Peter Susko said, commenting on metro blast in the Russian city. "As to the nature of the incident - whether terrorist or not - I would not speculate and rather wait for the results of the official investigation into the matter," the Slovak foreign ministry spokesman added. At least 22 people were hospitalized on Monday following a blast in St. Petersburg metro, the press secretary of St. Petersburg's governor said. "A total of 41 medical emergency response teams are working at the site of the incident. At least 22 people were sent to local hospitals," Andrei Kibitov wrote in his Twitter blog. UK Foreign Secretary Boris Johnson expressed on Monday his sympathies to the victims of the St Petersburg underground blast and their families. — Boris Johnson (@BorisJohnson) 3 апреля 2017 г.
Twitter users started posting content with the #PrayForSaintpetersburg hashtag after the deadly blast in the Russian city's metro. Russian Prime Minister Dmitry Medvedev on Monday expressed condolences to victims of a blast in St. Petersburg metro that reportedly caused an unspecified number of casualties, the Cabinet's press service said. "Prime Minister Dmitry Medvedev expressed condolences to the families of victims of the St. Petersburg metro blast," the press service said in a statement. Medvedev also instructed Russian Health Minister Veronika Skvortsova to provide all possible medical assistance to the people wounded in the incident. The deadly explosion that occurred in Saint Petersburg on Monday seem to be a terrorist attack, chairman of the Russian upper house of parliament's Defense Committee, Viktor Ozerov, told Sputnik. "Most likely, it is a terrorist act, all signs point to that, especially the existence of the damaging elements in the explosive devices," the lawmaker said. 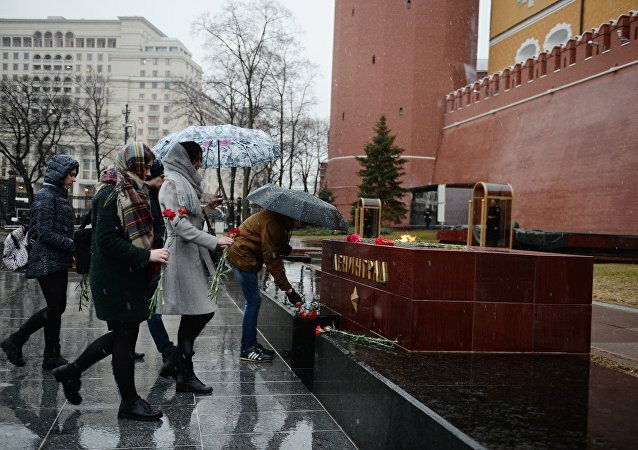 German government conveys condolences to the families of victims of blast in the underground of Russian city of St. Petersburg, government spokesman Steffen Seibert said Monday. "These are terrible news from #StPetersburg: Our compassion goes to all affected and their families," Seibert posted on his official Twitter page. The EU foreign ministers are following the news coming from St Petersburg following a blast in the city’s underground, EU foreign policy chief Federica Mogherini said Monday. — Federica Mogherini (@FedericaMog) 3 апреля 2017 г.
Moscow Mayor Sergei Sobyanin ordered on Monday to strengthen security at the Moscow subway and at local railway stations following a blast in St. Petersburg metro earlier in the day. "Moscow mayor has ordered police, Rosgvardia and Moscow subway authorities to boost security at all metro facilities," the Moscow subway authorities said in a Twitter message. The order also concerns Moscow's light rail central Ring and all local railway stations, the message said. — RT en Español (@ActualidadRT) 3 апреля 2017 г. The time and place of the explosion that occurred in Saint Petersburg metro on Monday may have been chosen by perpetrators to coincide with Russian President Vladimir Putin's visit to a media forum held in the city, chairman of the Russian upper house of parliament's Defense Committee, Viktor Ozerov, told Sputnik. "The choice of the place and the timing of this blast is not accidental, the president of Russia is in [Saint Petersburg], the media forum is taking place there, there are many journalists," Ozerov said. The senator noted that the relevant services may have failed to prevent the threat, including in terms of ensuring the security in the metro. Damascus condemned on Monday a blast in St. Petersburg underground, expressed sympathy to the people and authorities of Russia, the SANA news agency reported, citing an official source in the Syrian Foreign Ministry. "Syria most decisively condemns the coward terrorist attack in the St. Petersburg underground, which resulted in the deaths of innocent people and dozens of injuries," the source said. The source added that Damascus expressed sympathy and solidarity with Russia, its leadership, government and people, and also deeply sympathized with the families of the victims. The US embassy in Russia has extended condolences to the families of those killed and injured by a blast in the Saint Petersburg metro. "Shocked and saddened by explosions in St.Pete and the resulting deaths and injuries. Our hearts go out to victims and families," the embassy wrote on Twitter. — Посольство США в РФ (@USEmbRu) 3 апреля 2017 г. A group of experienced investigators and criminologists has been sent to investigate a blast in St. Petersburg metro on Monday, Russia's Investigative Committee said. "A group of experienced investigators and criminologists from the main directorate of the Investigative Committee was sent to St. Petersburg," Svetlana Petrenko, a spokeswoman for the Committee said. — RT на русском (@RT_russian) 3 апреля 2017 г.
Saint Petersburg's Pulkovo Airport is stepping up security measures after the deadly blast in the subway. "Security measures have been bolstered, in particular, the entrance inspection and preflight inspection," the airport's spokeswoman told Sputnik. Emergency services in Russia's St. Petersburg have been instructed to act in accordance with terrorist attack incident rules following a blast in the city's underground, Andrei Kibitov, the press secretary of city Governor Georgy Poltavchenko, said Monday. "Deputy Governor Igor Albin went to the site of the incident as instructed by the governor. All emergency services, relevant organizations and executive authorities, including the healthcare committee, have been put on alert. Orders were given to act in accordance with existing instructions applying to terrorist act incidents," Kibitov said, as quoted on the official city authorities VK social network page. Alexander was close to the Tekhnologichesky Institut station when the blast occurred. "I saw people being carried from the subway. This was horrible," he told Sputnik. 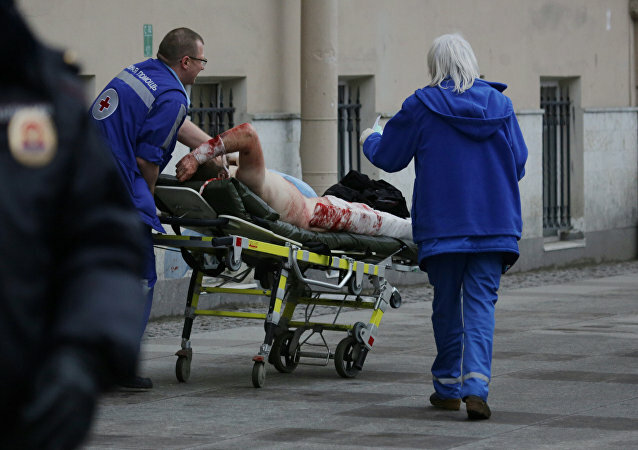 The blast in the St Petersburg metro left at nearly 50 people injured, the city's authorities said. — фестиваль (@findteen21) 3 апреля 2017 г. The Russian authorities will take all necessary measures to provide assistance to those injured in the blast in the St. Petersburg subway, Russian President Vladimir Putin said Monday. "The city authorities, and, if required, the federal authorities, will take all necessary measures to support the families of those killed and those injured," Putin said. 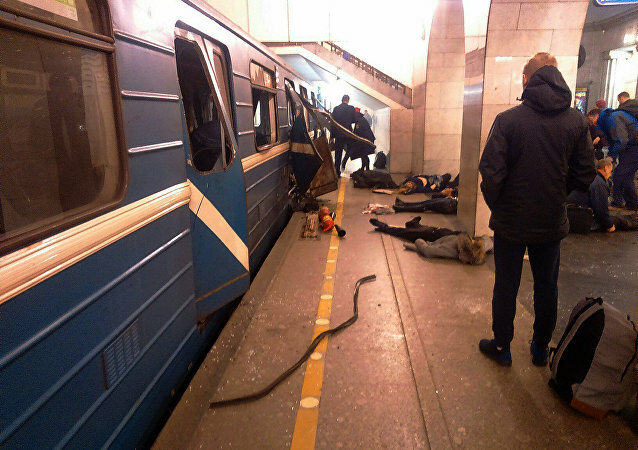 he evacuation of people from the St Petersburg metro is effectively over following a blast, Russia’s National Anti-terrorism Committee (NAK) spokesman Andrei Przhedomsky said Monday. "The evacuation has effectively ended, the wounded are being assisted," he said as broadcast on the Rossiya-24 television channel. According to him, the Russian Federal Security Service bomb squad and investigators are on the scene. 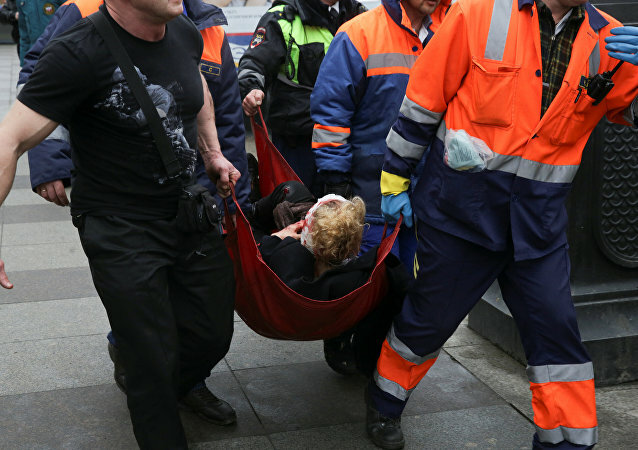 At least 30 people have been wounded in the St. Petersburg metro explosion, a medical source told Sputnik on Monday. "There are currently 30 wounded," the source said. An emergency services source told Sputnik earlier that the number of wounded was at least 20 people. В петербургском метро произошли взрывы на станциях «Технологический институт» и «Сенная площадь», есть погибшие. — Хоккейный клуб СКА (@hcSKA) 3 апреля 2017 г. All the stations of the metro in Saint Petersburg were shut after the blast. — Деловой Петербург (@dprunews) 3 апреля 2017 г.
Russian President Vladimir Putin was informed about the incident which occurred in the St Petersburg metro, Kremlin spokesman Dmitry Peskov said. St Petersburg prosecutors office has launched probe in relation to the blast in the city's metro which has occurred earlier in the day. "There was an explosion in one of the cars. There are injured and victims," a municipal law enforcement source told Sputnik. Meanwhile, three St. Petersburg metro stations have been closed and evacuations are underway following an explosion at one of them, the metro said Monday. "The entrance and exit to Tekhnologichesky Institut and Sennaya Ploshchad stations are closed, the trains are running without stopping. There is an evacuation of passengers," the metro said in a statement. People are being evacuated. Seven stations of the metro's blue line were shut. At least 10 people were killed and about 20 injured, RIA Novosti reports citing an unnamed source in the city's emergency ministry situation center. Children are reportedly among the victims. The explosive device that went off at one to two St. Petersburg metro stations has been rigged with shrapnel, Russian television reported Monday. "The explosive device was rigged with destructive elements," a Rossiya-24 broadcaster anchorwoman said on air. 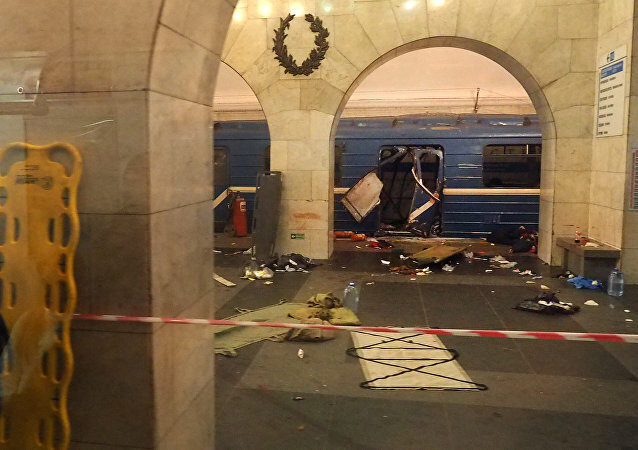 Blast occurred at the St Petersburg metro at 14-30 local time. The reported blasts occurred at the "Sennaya Ploschad [square]" and "Tekhnologichesky Institute" stations.